And Have a Relaxing Holiday Weekend! Want to see more of this handsome fella? Like the look of handmade fences? 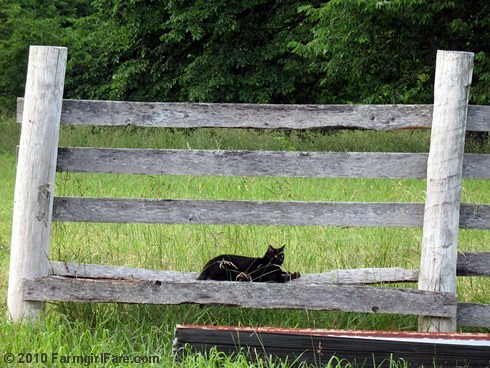 © FarmgirlFare.com, the physics-defying foodie farm blog where cats can manage to look totally comfortable just about anywhere, including on a slightly tilted but still mostly vertical wooden fence slat—which was in much better shape five years ago! Technical P.S. Our satellite service is being really wonky, and since the repair guy can't come out until next week I may disappear for a while (and also won't be able to moderate comments). But hopefully I'll be back with a faster Internet connection than ever! My friend has a beautiful black cat like that and they call him Captain Midnight. I really enjoy the posts can't wait to try the BBQ sauce. I will try it on my ribs. When I make them I put them in the slow cooker for 8 hrs first then put them on the grill to char them a bit. Then slather them with BBQ sauce take them to the cold side of the grill to set the sauce. Finger lickin' good!! Bunnies, like cats, find the strangest places in which to get comfortable.